Open-water fish pens in the traditional territories of British Columbia’s First Nations are threatening wild salmon. And if the salmon disappear, so will a 10,000-year-old way of life. “We are facing extinction,” Ernest Alfred, traditional leader of the ‘Namgis, Tlowitsis and Mamalilikulla First Nations in British Columbia, Canada, told Earther. Fish farms, which have been a big part of British Columbia’s economy for years, are considered a high environmental-impact aquaculture method. Waste from farmed fish raised in open pens along the coast can pass freely into the surrounding habitat, along with diseases. Farmed fish can also escape, as some 300,000 farmed Atlantic salmon did in late August off Cypress Island in Washington State’s northern San Juan islands, unbalancing the marine ecosystem. Atlantic salmon are a different species than those found in the Pacific, and while native to the northern Atlantic Ocean, they are farmed all along the Pacific Northwest. For these reasons, Alfred and several other indigenous leaders have occupied a Marine Harvest fish farm stocked with Atlantic salmon on Swanson Island, just north of Vancouver Island, for the past ten weeks. Salmon runs were alarmingly low this year, Alfred said—adding that he believed if fish farms weren’t removed soon, it would mean the extinction of wild salmon in the Broughton Archipelago. It would also mean the end of an important part of their indigenous culture. “I give up after this—if the government doesn’t get it this time we might as well give up and call ourselves white people,” Alfred said. “If there are no salmon, forget about the dances, our culture…it doesn’t mean squat if we can’t serve salmon at our ceremonies,” Alfred added. On Nov. 2, Alfred and and other indigenous leaders and activists will travel to the B.C. legislature to deliver the message that they want all 20 fish farms out of the Broughton Archipelago for good. He urged anyone and everyone who cares about wild salmon to travel to Victoria, B.C., to show support for their cause. There are fish farms—which began proliferating in B.C. in the 1970s—on every migration route in the sensitive Broughton Archipelago. Alfred says the farmed Atlantic salmon spread diseases to the wild juvenile salmon that migrate through the area. Biologist Alexandra Morton found that Marine Harvest farmed salmon were infected with piscine reovirus (PRV), a Norwegian salmon blood virus that is highly contagious. What’s more, a study supported by the B.C. Department of Fisheries and Ocean (DFO) found heart and skeletal muscle inflammation (HSMI) in B.C. salmon farms. HSMI leads to emaciated farmed fish, and can also infect wild salmon. In 2013, Ecojustice sued the DFO and Marine Harvest after learning that the company had transferred fish infected with piscine reovirus into an open-pen fish farm in Shelter Bay. “Salmon farms are just nets or cages open to our oceans. To stock them with farmed fish carrying viruses is playing biological roulette,” Morton said in a statement. “Failure to follow these protocols can result in the transfer of disease and parasites onto a site,” a spokesperson for the DFO told Earther in an emailed comment. 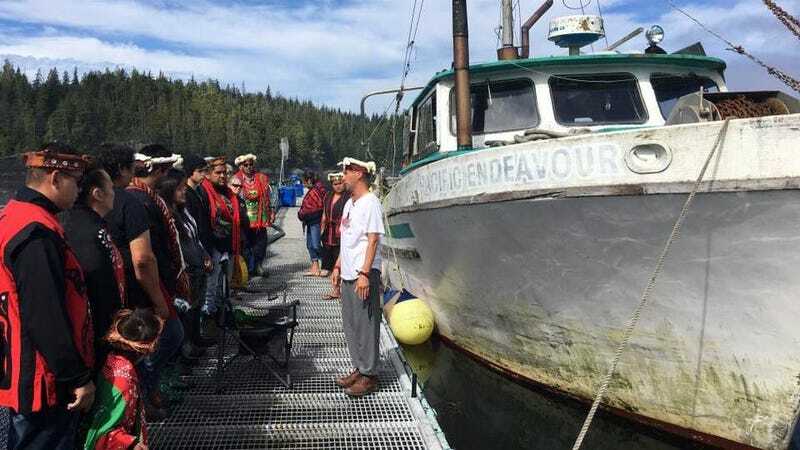 The same day Alfred and other indigenous leaders occupied Marine Harvest’s Swanson Island fish farm, a video was released with footage from B.C. fish farms showing deformed and diseased salmon. Sea Shepherd Conservation Society, an anti-poaching non-profit, provided a vessel and crew for research work on B.C. salmon—including supporting First Nation members in the making of the video, said Captain Paul Watson. “We’ve been pretty concerned about the impact of salmon farms on wild salmon for years, following Alexandra’s (Morton) research on that,” Watson said. Watson explained that they had suspected they would find many diseased farmed salmon in the pens, and they weren’t wrong. “We were not allowed onto the fish farms, that would be trespassing, but First Nations members were on board and lowered a GoPro into the salmon pens on a fishing rod,” Watson said. “They’re the ones who caught the images of the diseased fish in the pens,” Watson added. In a natural setting, diseased and deformed fish would be quickly dispatched by predators. But in the farms, they are allowed to survive—possibly spreading diseases to the wild salmon population, Alfred said. “These viruses are pouring out into major migration routes of our wild salmon,” Alfred said. Marine Harvest did not respond to a request for comment. A champion on the issue emerged recently from the B.C. government. Just a few weeks ago, Agriculture Minister Lana Popham said that she was taking the concerns of the First Nations leaders seriously, and told Marine Harvest that it might not get its permits renewed. After an accusation from Kristi Miller, a scientist at the DFO, saying that Animal Health Center senior fish pathologist Gary Marty’s research on the topic of diseased farmed fish was tainted by a conflict of interest because of his ties with the fish farm industry, Popham said there would be an investigation on the matter. But last week, B.C. Premier John Horgan said his office would be taking over those allegations, and Popham was effectively sidelined. Marty told reporters that he understood how it could look like he had a conflict of interest, but explained that the Animal Health Centre, the government laboratory in Abbotsford, B.C. where he works, is the only accredited diagnostic laboratory with board-certified veterinary fish pathologists. As such, it serves a wide-range of clients, including fish farms that own the diseased fish. Popham said in an emailed statement that this issue won’t be solved overnight, and that everyone needs to come to the table to negotiate in a respectful discussion. “Ensuring that wild salmon are protected is of the utmost importance to our government. Wild salmon provides sustenance for people and wildlife throughout our province, as well as bringing its own economic benefits. We also know that the fish farming industry brings stable jobs to small communities along our coast,” Popham said. She added that they are planning to have a meeting with all parties in November to continue the discussions and try to find a compromise that works for everyone. Alfred, meanwhile, said the fish farm industry has decimated many small coastal communities. Having a functioning ecosystem and the tourism that comes along with that is valued at much more than the fish farming industry, Alfred added. “When I was a child, I remember these returns, the millions of wild salmon that used to exist,” Alfred said. The salmon supported small, coastal communities which have since shriveled up “as a direct result of these farms,” Alfred said. With or without help from the government, First Nations leaders will continue to advocate for their rights. “The provincial government has claimed they would implement the United Nations Declaration of rights of indigenous people, yet they continue to allow permits for fish farms to operate in the Broughton Archipelago without consent,” said Mary Lovell, an environmental activist in B.C. “Their freezers stand empty this year because of how low the salmon runs have been. This is the lowest salmon year since time immemorial…putting wild salmon at risk puts their very livelihood and sovereignty at risk,” Lovell said. Only about half of the expected salmon returned this year on the Fraser River, CBC Canada reported. Salmon spawn in the Fraser River then go out to sea via the Broughton Archipelago. Alfred said there is an alternative to open pen fish farms—building fish farms on land. The ‘Namgis First Nation has been growing Atlantic salmon on farms on land. Scientists in the U.S. and elsewhere are also experimenting with the idea. But Alfred also questioned the need for farming fish at all. “If we take care of our salmon along the coast we don’t need to farm them,” he said.